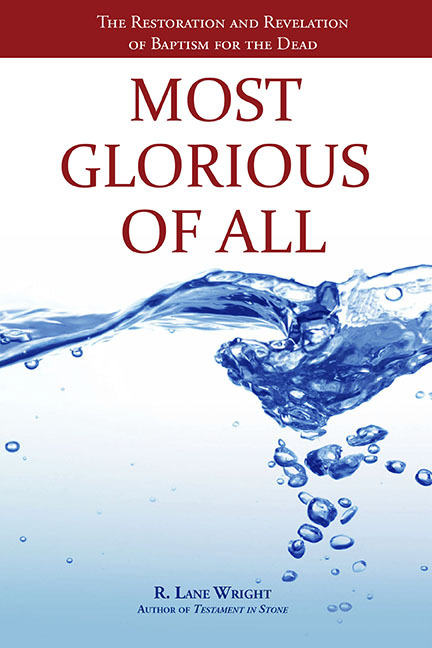 R. Lane Wright’s next book is Most Glorious Of All: The Restoration and Revelation of Baptism for the Dead. The author of best-selling Testament in Stone has a love for Church History, and for teaching gospel principles. Order now to have it before Christmas. Next year is the 175th anniversary of Joseph Smith’s instruction to the Saints on the principle of Baptism for the Dead. What better way to commemorate than to learn more about this “Most Glorious” of all subjects. What specifically did Elijah restore? What is the “welding link” Joseph spoke of? When was it actually revealed to Joseph? Who was Seymour Brunson, and why was Joseph preaching at his funeral? How did Baptism for the Dead help the Saints on their journey west? Order now and get it before Christmas.